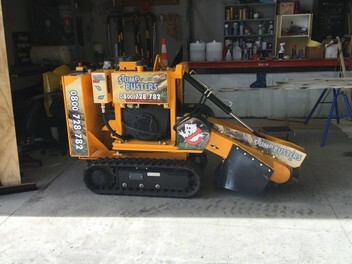 Stump Busters Ltd – We aint afraid of no stump! Expert, fully insured teams using specialist equipment to remove stumps in any domestic or commercial location. Our stump removal service covers the greater Auckland area and as far afield as Whangarei, plus the Waikato from Hamilton to Thames. We operate multiple stump removal teams. Call 0800 728 782 to book in your FREE, NO-OBLIGAT­ION, ON-SITE QUOTE. Who you gonna call when you’re stumped by tree or bush remains? Stump Busters of course! Unsightly tree or bush stumps can significantly reduce your property's curb appeal – and its resale value! They can also attract unwanted pests and insects, and spread disease throughout your garden. The quickest, most effective method for removing an unwanted stump is by stump grinding – grinding away both the stump itself and any surface roots. This removes all visible traces of the old stump, minimizes any chance of re-growth and leaves the area a blank canvas ready for new planting, paving or other building project. Our stump grinding teams have been successfully removing stumps from both residential and commercial properties for more than a decade. We operate the latest range of specialist stump grinder equipment and our stump grinding work is fully insured for your peace of mind. If you’re looking for affordable stump removal by a professional stump grinding service that you can rely on, then contact the team at Stump Busters on 0800 728 782 to arrange for your FREE, NO-OBLIGATION, ON-SITE QUOTE. Could not have wished for more. Prompt attendance for quotation. On acceptance of quote the job was completed within 24 hrs. Neat and tidy job. Thanks so much. Very pleasant and very efficient young lady! More than happy with the service. Thank you so much. Will make sure to save this contact should we ever need you again. Awesome team to deal and work with. Fast and efficient. Highly recommended. Fantastic result. Called and was there within 30min to quote and stump removed the following day. Couldn't be happier! Fantastic job done, both times. That pohutukawa tree didn't stand a chance. Wow...thankyou. Excellent service-quoted & job done! We would def use Stump Busters again...highly recommended!! Fantastic service, arrived on time, worked really hard and were accurate and careful not to damage anything, cheerful and competent, very reasonable charge, left the site tidy, highly recommended! Excellent communication and a professional job done. We had a one and a half metre in diameter stump to be removed. Bonnie and her partner were quick to complete this work and even dug a hole for our new tree. I was given advice about what woud be suitable to plant in this area- wouldn't hesitate to recommend this firm to any of my friends and colleagues. Excellent service, quote supplied, accepted, job completed within a couple of hours.......and done really well. Highly recommend. Excellent service. Quick to respond with a reasonable quote and completed a good job quickly and with no fuss. What more could you ask for? Highly recommended to others!